The athlete who swam across Craig “Crowie” Alexander’s legs was quickly lost in the scrum of churning bodies during the start of the 2014 IRONMAN World Championships. However, the throbbing pain of being kicked hard in his left calf remained as he edged away from the other pros to ensure he wasn’t kicked again. In more than 20 years of racing, Crowie had been jostled, elbowed, pushed, and kicked in many swim starts, but had never experienced such a direct blow. He continued to plow forward and had just re-established the rhythm of his stroke when the newly injured muscle suddenly seized. Instinctively curling into a ball, he reached to stretch the cramped calf, hoping for the relief that never came. From his undergraduate physiotherapy training, Crowie knew that there are many reasons muscles can cramp during exercise, including the sudden trauma of being kicked. Most people don’t realize that two-thirds of the nerves associated with skeletal muscles are sensory nerves that deliver real-time information from the muscle and its surroundings to the spinal cord and brain. That rich feedback ensures that muscle activity, position, tension, temperature, and chemical environment are constantly monitored and adjusted. In Crowie’s case, the damage to his calf sparked a tsunami of nervous impulses that traveled almost instantaneously from the damaged muscle to his spine and brain. Just as quickly, the motor nerves that extend from his lower spine to the calf began firing repeatedly, locking his calf muscle into a tight knot of contracted muscle cells. Unlike Crowie’s calf cramp, most exercise-associated muscle cramps (EAMCs) don’t result from obvious trauma, but from the unnoticeable changes that build over time to spark an outpouring of nervous impulses. Regardless of the circumstances of the cramp, the root cause is the same- hyper-active motor nerves that signal constant contraction. Until that signal is interrupted, the affected muscle is locked down by the cramp. Simply put, a cramp is a failure of normal neuromuscular function that occurs when motor nerves, alpha motor neurons to be precise, fire continuously. Whenever a motor nerve fires, all the muscle cells connected to it contract maximally. Normal neuromuscular function during any body movement is a finely orchestrated symphony of motor nerves turning on and off at appropriate times. That symphony is made possible by the fact that each motor nerve has tens of thousands of connections to nerves from the brain, with nerves from other segments in the spine, with small nerves within the spine (interneurons), and with nerves that deliver information from the contracting muscle (afferent sensory nerves.). The sum effect of this mind-boggling richness of input determines if the motor nerve remains quiet or fires. In contrast, a muscle cramp is not a finely orchestrated symphony, but is a screeching blast of neural noise that causes muscle cells to contract unrelentingly. Putting a quick end to that constant neural outflow requires an effective inhibitory input. Stretching a cramped muscle does just that by putting tension on the muscle tendons; that tension increases inhibitory signals from the tendon to the spine that effectively quiet the hyperactive motor nerves, bringing the cramp to an end1. Stretching can stop cramping, but during training and racing, stretching a cramped muscle is as effective as it is impractical. After all, no athlete wants to slow down, let alone stop, to get rid of a cramp. We know from experience as well as from science that we can occasionally keep cramps at bay by doing all the right things with pacing, hydration, nutrition, salt intake, and stretching routines. But often that isn’t enough to avoid cramping. As Crowie experienced, cramps can strike early in an event, when hydration, nutrition, and fatigue aren’t factors. 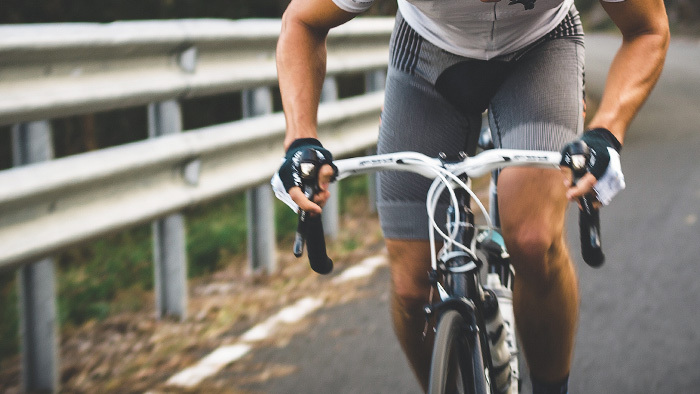 Recent research on the prevention and treatment of muscle cramps has identified a particularly effective intervention in the form of a proprietary formulation of organic ingredients that turn on sensory nerves in the mouth. Certain ingredients instantly activate Transient Receptor Potential (TRP) ion channels that reside in the membranes of nerves, sending nervous impulses from mouth to brain. For example, our brain senses that most peppers are hot because the TRP receptors turned on by peppers are the same receptors that sense hot temperatures of foods and drinks. The stimulation of TRP channels activates a neural pathway that radiates from the mouth to the brain, with additional neural signals sent down the spinal cord that return the hyperactive motor nerves to normal function2,3. Laboratory studies on human subjects have shown that activating TRP channels with a specific formulation of strong TRP-activating ingredients reduces the intensity and duration of cramps in two settings: induced by electrical stimulation of the muscle that flexes the big toe and in cramps caused by voluntary isometric contraction of the calf muscles. A recent Penn State study that used voluntary isometric exercise to produce calf cramps demonstrated that the electrical characteristics of EAMCs can be reduced by consuming a formulation containing strong TRP-channel activators. This is further evidence that cramps can be prevented or treated by this unique approach4. A field study with endurance athletes during normal training has shown a reduction in the frequency and severity of cramps when taking the formulation 15 to 30 minutes prior to exercise5. Interestingly, athletes have reported additional benefits after consuming the formulation prior to training and these benefits are now being studied. One such benefit is the reduction in post-exercise muscle soreness. In fact, the PSU study demonstrated lower ratings of muscle soreness in the 20 minutes following a cramp. And the majority of the athletes in a field study also reported reduced post-exercise muscle soreness. Although additional research is needed to confirm the possibility that stimulating TRP channels is associated with benefits beyond cramp prevention and muscle soreness, that possibility is not far-fetched. For example, a mouth-to-brain-to-muscle connection has already been shown to exist because simply rinsing the mouth with a carbohydrate solution improves cycling performance6. When muscles are burning from fatigue or painfully locked in a cramp, it’s easy to forget that the nervous system is also affected. Nerves and muscles have to work in sync to produce peak performance, with fatigue and cramping being obvious examples of compromised neuromuscular function. Future research may shed more light on how else athletes can benefit from innovative interventions that rely on the mouth-to-brain-to-muscle connection. For the past year, Crowie’s training and racing has been cramp-free. In 2016, the 43-year-old continues to demonstrate that age is merely a number through his string of recent victories at the IRONMAN 70.3 distance. Crowie has found the right formula to control his neuromuscular performance and extend his professional career in the top tier of the sport. Bob Murray, PhD, FACSM is managing principal of Sports Science Insights, LLC, a consulting group that assists companies and organizations in need of targeted expertise in exercise science and sports nutrition. SSI’s clients range from start-ups to Fortune 100 companies. Prior to starting SSI, Dr. Murray was the co-founder and director of the Gatorade Sports Science Institute from 1985 to 2008. Dr. Murray’s research on the hydration needs of athletes and the physiological and performance responses to fluid, carbohydrate, and electrolyte ingestion has contributed to the broader understanding of the importance of being well hydrated during exercise. Dr. Murray received his PhD in exercise physiology from Ohio State University, is a Fellow of the American College of Sports Medicine, and an honorary member of the Academy of Nutrition and Dietetics.